Team Alvimedica�s skipper Charlie Enright won the final offshore battle of the Volvo Ocean Race here today, but the overall glory belonged firmly with his rival from Abu Dhabi Ocean Racing, Ian Walker. Team Alvimedica's skipper Charlie Enright won the final offshore battle of the Volvo Ocean Race here today, but the overall trophy belonged firmly with his rival from Abu Dhabi Ocean Racing, Ian Walker. Only one team, Team Vestas Wind (Chris Nicholson/AUS), have failed to win a leg - and they missed five because of a boat rebuild. 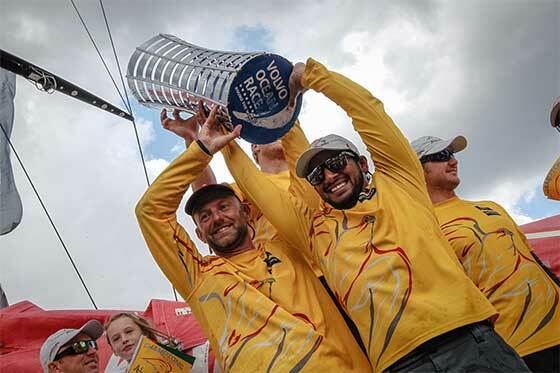 Behind Enright, in fifth, Walker's boat, Azzam, slipped almost quietly into port, but the mile-wide smiles on all the crews' faces told their own story: We are the Champions! "I said at the start of the race that I was confident, but there are 100 ways to lose this race but only one way to win it. And it just all came together for us perfectly," a jubilant Walker told reporters on dockside. Despite not being able to hold off Spanish challengers, MAPFRE (Iker Martínez/ESP), for third position, Charles Caudrelier's crew still took the final place on the podium in third place overall - an incredible result with four Chinese rookie sailors in their ranks. Fourth place overall, though, will have to be decided in the final act of the 2014-15 edition, Saturday's (June 27) Inmarsat In-Port Race Gothenburg, when Team Alvimedica and MAPFRE, tied on 34 points, will duel to break the deadlock. 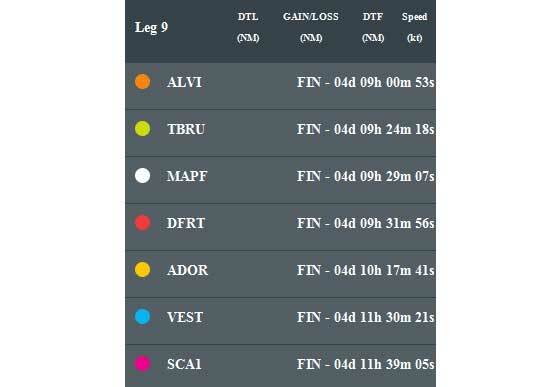 Their sponsors, crew and shore team never gave up hope of returning, however, and the second-placed finish of the blue Danish boat in Leg 8 to Lorient from Lisbon, will remain one of the 12th edition's most cherished memories. Finally, the all-women's crew of Team SCA (Sam Davies/GBR) completed the fleet's arrivals in Gothenburg. As ever, they were competitive and right on the heels of their male rivals. Their victory in Lorient in the leg from Lisbon proved that women can be - and are - competitive in the world's toughest offshore sailing event. With the huge following that Sam Davies's team attracted and their legacy of leg-by-leg improvements, we surely will not have to wait another 12 years for another female crew to take their place in a Volvo Ocean Race fleet. Final standings: 1) Abu Dhabi Ocean Racing 24 pts, 2) Team Brunel (Netherlands) 29, 3) Dongfeng Race Team (China) 33, 4=) Team Alvimedica (Turkey/USA) 34, MAPFRE (Spain) 34, 6) Team SCA (Sweden) 51, 7) Team Vestas Wind (Denmark) 60.